How does aloe vera and young coconut tapioca with pineapple sorbet sound like? 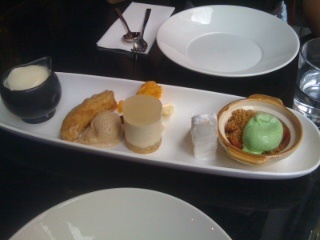 Maybe vanilla tofu cheesecake with lychee jelly or anise roasted stone fruit and cashew crumble with pandan ice cream? Add coconut and chilli chocolate splice, candied chilli and water chestnut with banana fritters and yellow rock sugar and cinnamon ice cream with a glass of Seppelt’s sparkling shiraz and you will be in dessert-haven. Plan not to walk for a while. Varos suena espectacular y muy diferente a todos los postres,va ahumentando la lista de cosas para preparar para mamá,jejeje.